This article contains facts and information about the life and times of the famous Native American Indian chief known as Canonicus. Who was Canonicus and why was this Native Indian chief famous? 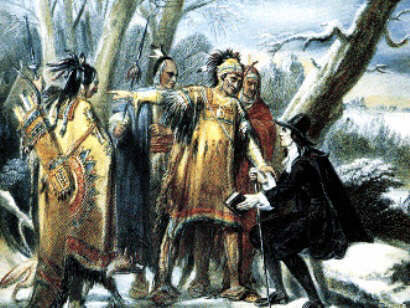 Summary: Canonicus was a chief of the Narragansett tribe during the 1600s and was famous for selling land in Rhode Island to Roger Williams. In 1636, Canonicus agreed to fight alongside the colonists during the Pequot War (1634 - 1638). In 1675, a Narragansett settlement was mauled in the Great Swamp Fight, greatly reducing Narragansett numbers and influence. The following fact sheet contains interesting facts, background history and information about the life of Canonicus and the events in history that led to his fame as a great Native American Indian leader. Canonicus c.1565–1647 was a highly respected sachem of the Narragansett tribe in Rhode Island during the 1600s. The Narragansetts were a large and warlike people, who were accomplished fighters. Their country covered nearly all present Rhode Island. The dual sachems, Canonicus and Miantonomi, had gained their ascendancy in war with their main rivals, the Wampanoag tribe, who were governed by the sachem Massasoit, the father of Metacom (King Philip). Discover the vast selection of pictures on the subject of the tribes of Famous Native Americans such as Canonicus. The pictures show the clothing, war paint, weapons and decorations of various Native Indian tribes, such as the Narragansett tribe of Canonicus, that can be used as a really useful educational resource for kids and children of all ages studying famous Native Americans such as Canonicus. We hope you enjoy watching the video - just click and play - a great educational resource for kids.